Tag words: regulation, metabolism, enzyme induction, enzyme repression, lactose operon, lac operon, trp operon, tryptophan operon, catabolite repression, feedback inhibition, repressor, inducer, allosteric protein. Unlike plant and animal cells, most bacteria are exposed to a constantly changing physical and chemical environment. Within limits, bacteria can react to changes in their environment through changes in patterns of structural proteins, transport proteins, toxins, enzymes, etc., which adapt them to a particular ecological situation. For example, E. coli does not produce fimbriae for colonization purposes when living in a planktonic (free-floating or swimming) environment. Vibrio cholerae does not produce the cholera toxin that causes diarrhea unless it is in the human intestinal tract. Bacillus subtilis does not make the enzymes for tryptophan biosynthesis if it can find preexisting tryptophan in its environment. If E. coli is fed glucose and lactose together, it will use the glucose first because it takes two less enzymes to use glucose than it does to use lactose. The bacterium Neisseria gonorrhoeae will develop a sophisticated iron gathering and transport system if it senses that iron is in short supply in its environment. Bacteria have developed sophisticated mechanisms for the regulation of both catabolic and anabolic pathways. Generally, bacteria do not synthesize degradative (catabolic) enzymes unless the substrates for these enzymes are present in their environment. For example, synthesis of enzymes that degrade lactose would be wasteful unless the substrate for these enzymes (lactose) is available in the environment. Similarly, bacteria have developed diverse mechanisms for the control of biosynthetic (anabolic) pathways. Bacterial cells shut down biosynthetic pathways when the end product of the pathway is not needed or is readily obtained by uptake from the environment. For example, if a bacterium could find a preformed amino acid like tryptophan in its environment, it would make sense to shut down its own pathway of tryptophan biosynthesis, and thereby conserve energy. However, in real bacterial life, the control mechanisms for all these metabolic pathways must be reversible, since the environment can change quickly and drastically. Some of the common mechanisms by which bacterial cells regulate and control their metabolic activities are discussed in this chapter It is important for the reader to realize that most of these mechanisms have been observed or described in the bacterium, Escherichia coli, and they are mostly untested and unproved to exist in many other bacteria or procaryotes (although, whenever they are looked for, they are often found). The perceptive reader will appreciate that the origins of the modern science of molecular biology are found in the experiments that explained these regulatory processes in E. coli. As stated above, bacterial cells can change patterns of enzymes, in order to adapt them to their specific environment. Often the concentration of an enzyme in a bacterial cell depends on the presence of the substrate for the enzyme. Constitutive enzymes are always produced by cells independently of the composition of the medium in which the cells are grown. The enzymes that operate during glycolysis and the TCA cycle are generally constitutive: they are present at more or less the same concentration in cells at all times. Inducible enzymes are produced ("turned on") in cells in response to a particular substrate; they are produced only when needed. In the process of induction, the substrate, or a compound structurally similar to the substrate, evokes formation of the enzyme and is sometimes called an inducer. A repressible enzyme is one whose synthesis is downregulated or "turned off" by the presence of (for example) the end product of a pathway that the enzyme normally participates in. In this case, the end product is called a corepressor of the enzyme. Not all enzymatic reactions occur in a cell to the same extent. Some substances are needed in large amounts and the reactions involved in their synthesis must therefore occur in large amounts. Other substances are needed in small amounts and the corresponding reactions involved in their synthesis need only occur in small amounts. In bacterial cells, enzymatic reactions may be regulated by two unrelated modes: (1) control or regulation of enzyme activity (feedback inhibition or end product inhibition), which mainly operates to regulate biosynthetic pathways; and (2) control or regulation of enzyme synthesis, including end-product repression, which functions in the regulation of biosynthetic pathways, and enzyme induction and catabolite repression, which regulate mainly degradative pathways. The process of feedback inhibition regulates the activity of preexisting enzymes in the cells. The processes of end-product repression, enzyme induction and catabolite repression are involved in the control of synthesis of enzymes. The processes which regulate the synthesis of enzymes may be either a form of positive control or negative control. End-product repression and enzyme induction are mechanisms of negative control because they lead to a decrease in the rate of transcription of proteins. Catabolite repression is considered a form of positive control because it affects an increase in rates of transcription of proteins. Table 1. Points for regulation of various metabolic processes. Bacteria exert control over their metabolism at every possible stage starting at the level of the gene that encodes for a protein and ending with alteration or modifications in the protein after it is produced. For example, variation in gene structure can vary the activity or production of a protein, just as modifications of a protein after it is produced can alter or change its activity. One of the most important sites for control of metabolism at the genetic level is regulation of transcription. At this level, in positive control mechanisms (e.g. catabolite repression), a regulatory protein has an effect to increase the rate of transcription of a gene, while in negative control mechanisms (e.g. 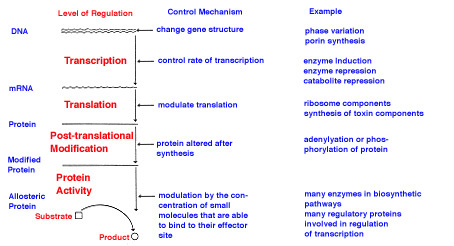 enzyme induction or end product repression), a regulatory protein has the effect to decrease the rate of transcription of a gene. Sometimes this nomenclature may seem counter-intuitive, but molecular biologists have stuck us with it. Although there are examples of regulatory processes that occur at all stages in molecular biology of bacterial cells (see Table 1 above), the most common points of regulation are at the level of transcription (e.g. enzyme induction and enzyme repression) and changing the activity of preexisting proteins. In turn, these levels of control are usually modulated by proteins with the property of allostery. An allosteric protein is one which has an active (catalytic) site and an allosteric (effector) site. In an allosteric enzyme, the active site binds to the substrate of the enzyme and converts it to a product. The allosteric site is occupied by some small molecule which is not a substrate. 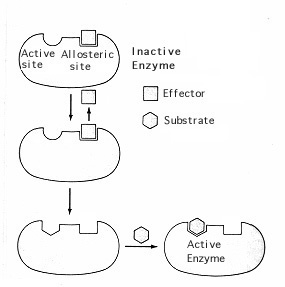 However, when the allosteric site is occupied by the effector molecule, the configuration of the active site is changed so that it is now unable to recognize and bind to its substrate (Figure 1). If the protein is an enzyme, when the allosteric site is occupied, the enzyme is inactive, i.e., the effector molecule decreases the activity of the enzyme. There is an alternative situation, however. 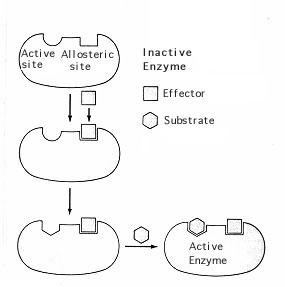 The effector molecule of certain allosteric enzymes binds to its allosteric site and consequently transforms the enzyme from an inactive to an active state (Figure 2). Some multicomponent allosteric enzymes have several sites occupied by various effector molecules that modulate enzyme activity over a range of conditions. Figure 1. Example of an allosteric enzyme with a negative effector site. When the effector molecule binds to the allosteric site, substrate binding and catalytic activity of the enzyme are inactivated. When the effector is detached from the allosteric site the enzyme is active. Figure 2. Example of an allosteric enzyme with a positive effector site. The effector molecule binds to the allosteric site resulting in alteration of the active site that stimulates substrate binding and catalytic activity. Some allosteric proteins are not enzymes, but nonetheless have an active site and an allosteric site. The regulatory proteins that control metabolic pathways involving end product repression, enzyme induction and catabolite repression are allosteric proteins. In their case, the active site is a DNA binding site, which, when active, binds to a specific sequence of DNA, and which, when inactive, does not bind to DNA. The allosteric or effector molecule is a small molecule which can occupy the allosteric site and affect the active site. In the case of enzyme repression, a positive effector molecule (called a corepressor) binds to the allosteric regulatory protein and activates its ability to bind to DNA. In the case of enzyme induction a negative effector molecule (called an inducer) binds to the allosteric site, causing the active site to change conformation thereby detaching the protein from its DNA binding site.